Since I started asking for recommendations of books to read back in late 2011, I’ve been inundated with suggestions of tempting-sounding titles from around the globe. To this day, I receive messages and comments from booklovers across the world sharing some of their favourite reads with me. I still add all valid recommendations to the list and hope to continue doing so for a long time to come. Among the welter of titles I have heard about over the last three years, however, there have been several that have stood out as being particularly admired. November’s book of the month is a prime example. Its writer, David Grossman, has been mentioned to me by a large number of readers – so much so that I very nearly picked one of his novels as my Israeli choice for A Year of Reading the World. It was only my curiosity about the premise of Aharon Appelfeld’s Blooms of Darkness that made me plump for that instead. 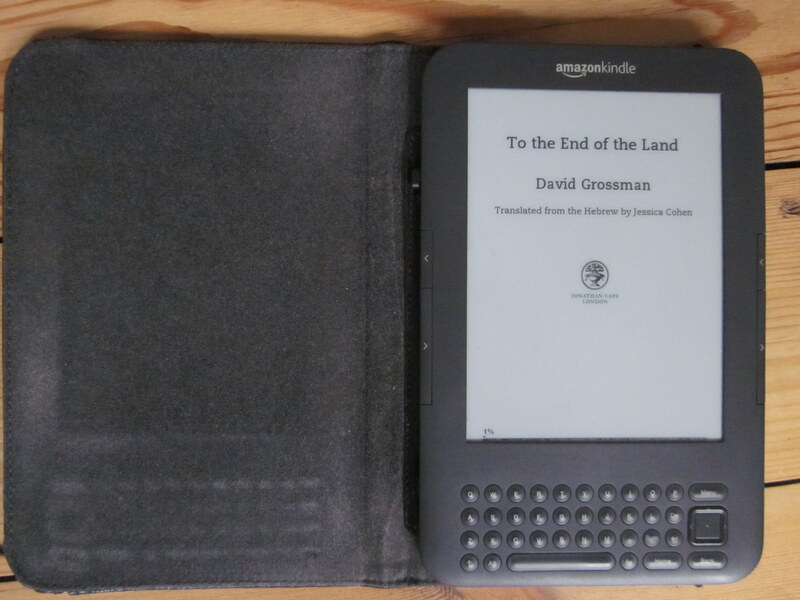 So it’s great to be able to report back to you on one of Grossman’s books now: To the End of the Land, which was translated into English in 2010, two years after the original appeared in Hebrew. The novel tells the story of three Jewish characters, Ora, Avram and Ilan, whose lives are intertwined from the moment they meet as teenage patients in a plague hospital in 1967. As they grow up, they are shaped and twisted by their loyalties and the cruel events of Israel’s modern history, which simultaneously bind and divide them through a web of secrets and regrets. But when her younger son Ofer volunteers for further service with the Israel Defence Forces, Ora is unable to stand the pressure anymore. Terrified that every moment will bring a knock at the door to notify her of his death, she sets out with Avram on a trek across the country to Galilee, covering old ground in search of peace. Few books contain so many deft depictions of the fluctuating dynamics of human relationships. From the seismic shifts that break, warp and split lives, to the momentary lapses and dissemblances that colour conversations, this book has it all, with joyous bursts of humour to boot. For example, we see the moment-by-moment collapse of a longstanding relationship during the disastrous taxi ride taking Ofer to the front for which Ora unthinkingly books her trusted Arab driver, Sami, and through it the way that ‘the fears and hatred [they] both drank with [their] mother’s milk’ make certain things impossible – for all that Ora and Sami may laugh and rail together against ‘the long-winded indignant, greedy pretenses of both Jews and Arabs’ in times of relative tranquillity. The descriptions of the wild places Ora and Avram pass through, dotted with memorial plaques to fallen soldiers and ruined Arab villages, are powerful, but it is the mental and emotional landscape that takes centre stage. Among the many extraordinary passages are a series of narrations from Ora about her memories of raising her sons, which transfigure the mundane incidents of domestic life into searing revelations of the myriad ambiguities and moral compromises that go into making up a human being. The scene in which the young Ofer discovers the truth about where meat comes from will stay with me for a long time – as will Grossman’s afterword, in which he discusses briefly the death of his son in military service in 2006 (the experience, he says, changed ‘the echo of the reality in which the final draft was written’). Congratulations have to go to translator Jessica Cohen for her work with what must have been a challenging text – just one of the many conundrums being a passage where Ofer’s brother Adam talks exclusively in rhyme. My only quibble was with the choice of the word ‘pub’ for many of the various bars featured in the text, but this may not bother American readers – at whom this version was primarily aimed. I love your review. You make me want to read the book. I had heard of Grossman, I have even read several interviews he has given, so now I really want to read his books. Thanks Nicholas – I hope you enjoy them. Great. I can imagine it would make a really good audiobook. The Book is really nice as I heard from my friend who purchased the book. Ya Holidays are the best time to read books. This sounds fascinating. Will be sure to look it up. Great – hope you enjoy it. A Horse Walks into a Bar (Hebrew: סוס אחד נכנס לבר‎‎) is a novel by Israeli author David Grossman.The novel won the 2017 Man Booker International Prize. I would like to recommend on the book : My Russian Grandmother and Her American Vacuum Cleaner: A Family Memoir by Israeli author Meir Shalev . I’m so happy after reading this review, next month I’ll visit Israel and this seems to be the book I’m looking for. Thanks for so valuable and informative post!